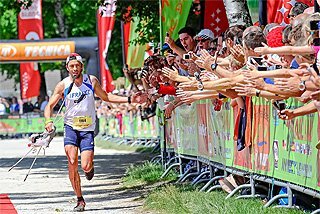 Statisticians A Lennart Julin and Mirko Jalava look back on the best middle-distance performances of the year. David Rudisha ruled this event for four years, culminating in the unforgettable Olympic final in London. However, when he returned to the championship scene in Beijing – after a couple of injury plagued years – it looked as though he never had been away. Rudisha once more majestically strode along unchallenged at the front all the way to the finish line. But there was one major difference: the pace. Rather than 49/50 seconds, the first lap was covered in a leisurely 54 seconds, yet still no opponent took any action. Rudisha’s mere presence seemed to have a paralysing effect. Perhaps the scenario would have been different had Nijel Amos not been eliminated in a slow and tactical semi-final. Overall, Amos was the most consistent 800m runner of 2015, never finishing below second and having three performances at 1:43.28 or better. He also defeated Rudisha in both of their pre-Beijing encounters. Amos belonged to the ‘teenage wave’ that hit the 800m scene in 2012, but being a teenage phenomenon is not a prerequisite for success in this event. 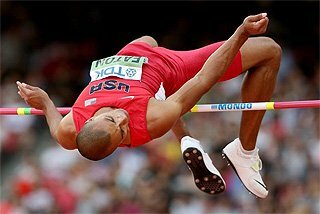 Just ask Amel Tuka and Boris Berian. Tuka ran 1:51 as junior and had a 1:46 PB coming into this year. But within the space of 17 days in July, the Bosnian ran 1:44.19, 1:43.84 and 1:42.51 before going on to take bronze in Beijing. Berian was a 400m runner in his teens and came into 2015 with a 1:48.89 PB. His rise was also meteoric: 1:46.16 in April, 1:45.30 in May, 1:43.84 for second behind Rudisha at the IAAF Diamond League meeting in New York and 1:43.34 for fourth place in Monaco. There is little doubt that Asbel Kiprop is the outstanding 1500m runner of the post-El Guerrouj era. 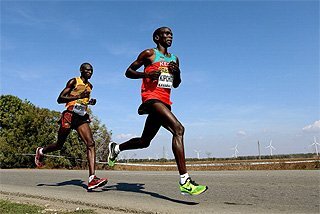 But despite having won a number of major titles, Kiprop has in previous years also lost a number of slower races after finding himself with too much catching up to do on the final lap. In 2015, his ninth year on the international scene, Kiprop didn’t make any costly mistakes and his long-striding kick looked better than ever. In a slow 1500m final at the IAAF World Championships Beijing 2015, Kiprop was in 10th place with just 300 metres to go. He then duly flew past his nine opponents, all of whom were all-out sprining, to take gold. For the fourth straight year Kiprop had chosen Monaco as the meeting to go to for a fast time. After 3:28.88 in 2012, 3:27.72 in 2013 and 3:28.45 in 2014, Kiprop lowered his PB to 3:26.69, just 0.69 off the world record and moving him to third on the world all-time list. 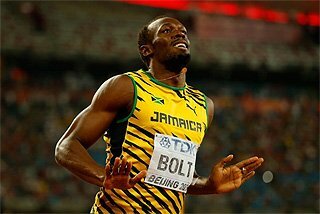 His mark is the fifth-fastest time ever and the fastest in the world for 14 years. Thanks to Kiprop, the IAAF Diamond League meeting in Monaco has become ‘the’ 1500m race of the season. This year it provided the top seven marks in the world. Of those seven athletes, Mo Farah was the only one who didn’t set a PB in Monaco. The largest improvement belonged to exciting Kenyan newcomer and former 400m runner Elijah Manangoi, who knocked five seconds off his best when clocking 3:29.67. 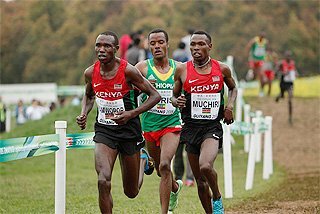 Manangoi went on to take the silver medal in Beijing. Kenya’s 2013 world champion Eunice Sum was in good form during the early part of the 2015 season. 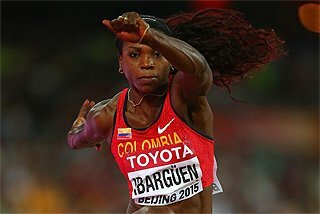 The 27-year-old won all of her six finals prior to Beijing, including five IAAF Diamond League meetings, including a world-leading 1:56.99 personal best in Paris in July. 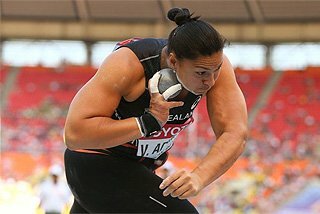 But at the IAAF World Championships Beijing 2015, she had trouble qualifying for the final from the hardest semi-final. In retrospect, it wasn’t a surprise, because the top three from this semi-final were also the three medallists in the final, albeit in a different order. European champion Maryna Arzamasova went to Beijing off the back of a completely different season compared to Sum. 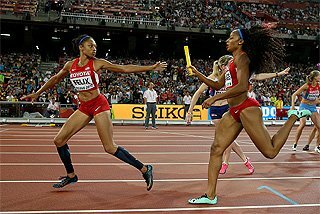 The 27-year-old Belarusian had nothing to show before Beijing; she had a season’s best of just 2:00.87 and two fourth-place finishes in international competition before the World Championships. But she won her heat in 1:58.69 before advancing to the final with a PB of 1:57.54. In the final, Arzamasova took the lead with 200 metres to go and just held on to win in 1:58.03. The biggest surprise in Beijing was Melissa Bishop. 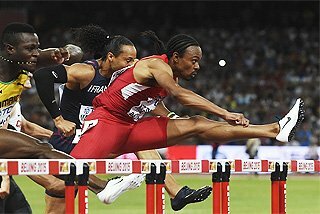 The 27-year-old Canadian dipped under two minutes for the first time in 2012, but had not really progressed beyond that level since. She won the Pan American Games in Toronto in July, but still her 1:57.52 national record to win in the third semi-final was a shock. Bishop went on to take the silver medal in the final in 1:58.12 with Sum in third place in 1:58.18. It was a season of fast times for the women’s 1500m. The first sub-four-minute race came early, at the start of June in Rome. USA’s 2011 world champion Jenny Simpson won in a world-leading 3:59.31 as Sifan Hassan and 18-year-old Ethiopian Dawit Seyaoum also finished within four minutes. But in early July Genzebe Dibaba, the world indoor record holder, produced a huge solo performance at the Catalunyan Championships in Barcelona. The 24-year-old crushed the African record with 3:54.11. Significantly, she was totally alone for the last 800m and finished with a 61.1-second last lap. 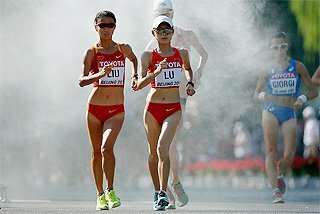 After this it was clear that Qu Yunxia’s world record of 3:50.46, which had stood for almost 22 years, was finally in jeopardy. Just nine days later, Dibaba attacked that mark at the IAAF Diamond League meeting in Monaco and memorably set a 3:50.07 world record. Behind her, Hassan set a Dutch record of 3:56.05 for second place and in third Shannon Rowbury broke the North American record with 3:56.29. Simpson was fourth in 3:57.30 and Britain’s Laura Muir was fifth in a PB of 3:58.66. 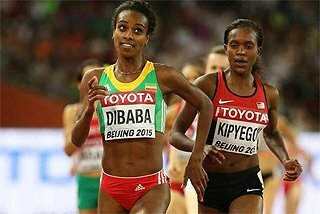 Dibaba was the overwhelming favourite for the 1500m title at the IAAF World Championships Beijing 2015. 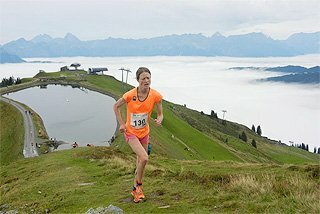 Having broken the world record and being a fast finisher, there was nothing the others could do tactically to beat her. In a slow race, the script was easy and Dibaba sprinted away for the gold in 4:08.09, having covered the final 800m in 1:57.2. It was her first senior outdoor global gold medal, having won world indoor titles in 2012 and 2014. Kenya’s Faith Kipyegon took the silver in 4:08.96, having raced in just two international races before Beijing, finishing in second place in both Oslo and Lausanne. Hassan, the European champion indoors and out, took the bronze in 4:09.34.